Organizational sustainability is an orientation, not a destination. When making strategic decisions to strengthen sustainability, leadership must understand how the market affects the organization’s business model. Strategies and tactics to achieve this orientation will inevitably evolve as constituent needs, programmatic best practices, revenue and talent availability, the landscape of competitors and collaborators, and community perceptions change. Market analysis enhances sustainability by elucidating opportunities and challenges for the organization’s programs. Analyzing the market won’t, on its own, dictate a fool-proof strategy for an organization to cope with its changing market. However, understanding how the changing market influences the organization will give leadership an idea of how its mission-specific and fund development activities could be altered to be more responsive to market trends. Some programs may be well positioned to seize partnership opportunities or meet the changing needs of constituents, while others may need to be redesigned or even phased out. How quickly is each market component changing relative to the others? In relative terms, how significantly would a change impact the organization’s sustainability (impact and financial viability)? 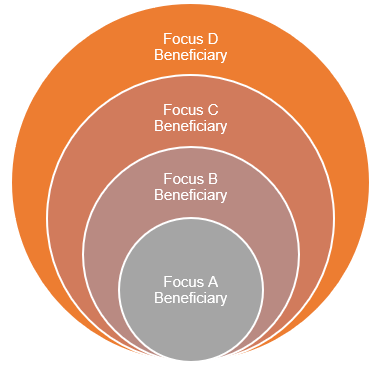 To conduct this prioritization activity, rate the speed at which individual components are changing and the significance with which each impacts the organization on a scale of 1 to 5. It’s worth noting that this survey is an excellent time to engage board members. If your board has representation from all aspects of the market, collectively they will bring unique insight into how the community is changing. Further, this kind of exercise provides an opportunity to educate board members on the effect of market aspects on the impact and profitability of certain programs. These conversations can set a firm foundation when it’s time for the nonprofit to set and implement strategic priorities. By totaling the two numbers, the organization can determine which segments of the market are most volatile. Using a table to summarize this analysis, and the color coding scheme described below, you’ll create a visual representation of the volatility or placidity of your market. Red: Score 8 or 10 “High Priority” – These aspects of the organization’s market are either changing rapidly or having a significant effect on the organization’s business model. They must be addressed when setting strategy. Yellow: Score 5 to 7 “Bears Watching” – These aspects are on the edge, perhaps not as a high a priority as other aspects of the market, but should be watched to better understand how they may influence the organization’s business model. Green: Score 2 to 4 “Stable Influence” – These aspects are relatively stable and not in need of in-depth monitoring. Nonprofit leaders are stretched thin as it is. Their attention is pulled in every direction, which makes evaluating key decisions in this matter critical as organizations adapt, compete, and collaborate. Our next piece will explain an approach to synthesize a market and business model analysis. If you have a strategic plan, or have participated in a matrix mapping process with us, we’ll outline how market analysis can play a role in helping determine initial priorities during implementation. 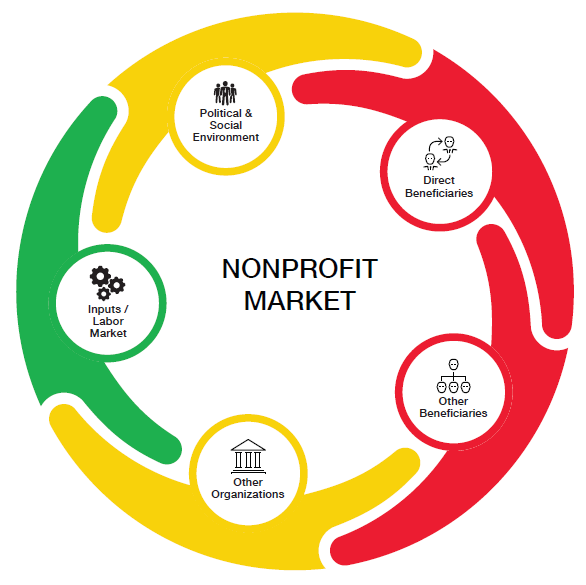 This blog is part four of our series on Community Influence & Understanding Nonprofit Markets, which is drawn from our new white paper by the same name. Check out our third blog on this topic, Constituents & Potential Funders.